The Chinese government's statement came after Prime Minister Recep Tayyip Erdoğan announced in a TV interview last week that Turkey might seek membership in the SCO, given the stalled negotiations with the European Union that Turkey has struggled for 40 years to join. "I recently said to [Russian President Vladimir] Putin: ‘Take us into the Shanghai Five. Take us and we will say goodbye to the EU.' 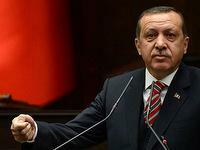 What's the point of stalling?” Erdoğan said, referring to the SCO by its previous name. Acknowledging for the first time in public Erdoğan's comment that “the SCO is much better than the EU,” which led to a wide range of debate and discussion, Chinese analysts say Ankara's decision to move toward the SCO matches the actual development and power of Turkey in the region. That is, Turkey can choose to go for the SCO or for the EU. “Since the EU has not accepted Turkey, Turkey can search for a new way. Strengthening the relationship with the SCO will help Turkey to realize its strategic goal for 2023,” Professor Wang Lincong, director of the international relations division of the Institute of West Asian and African Studies and secretary-general of the Gulf Research Center, Chinese Academy of Social Sciences (CASS), said in an interview with Today's Zaman. In 2023 Turkey will mark the 100th anniversary of the establishment of the Turkish Republic. It is also a critical date that Turks have set to achieve their strategic mission for a competitive economy, a proactive foreign policy and becoming a regional energy hub, all of which will affect Turkey's role in the world. According to Lincong, the EU has shown by its treatment of Turkey's bid for membership that it still cannot get beyond its narrow, exclusive and inward-looking characteristics and does not realize the importance of the acceptance of Turkey. The SCO is an intergovernmental security organization composed of six member countries: China, Russia, Kyrgyzstan, Tajikistan, Kazakhstan and Uzbekistan, and which some say also has a strategic goal of ending the global hegemony of the US, Turkey's NATO ally. Turkey officially applied to the SCO for “dialogue partnership status" in March 2011, which was approved at the Council of Heads of State Summit in Beijing a few months later. Now, Turkey is waiting for the signing of a memorandum of understanding between the SCO and Turkey as the third “dialogue partner,” following Belarus and Sri Lanka.